I lived several years in the Galapagos Islands & one thing that stands out from that time is how beautiful the beaches were. White sand, clear waters, the surf, rocky shores, the animals, the quiet of it all; I was growing up in a paradise and didn’t know it. One that particularly stands above the others is the beach at Tortuga Bay. This beach was big, stretching for miles, with dunes about 50 ft tall, a quiet inlet for swimming, heavy seas past the breakers, and the water was a clear turquoise where you could see all the fish. There were a lot of indigenous animals such as tropical fish, red crabs, blue footed boobies, sea lions, sharks, manta rays, penguins, sea turtles, etc. We also saw plenty of donkeys & goats, wild animals left by the settlers back in the 1700’s. I’d forgotten the name of the beach but I could see it in my mind’s eye. I close my eyes and I can see it, smell the salt, walk the inlet, let the sand run through my toes & roll down the sand dunes. The dunes were so big that it took a long time to climb them. Now that I have seen a lot of beaches as an adult, I can appreciate how big and pristine this beach was. Then, I Googled the name of the beach and studied maps of the islands and, lo & behold, the name of the beach was “Tortuga Bay”. The descriptions included pictures taken by tourists on vacation. It is the one from my childhood and it is the same as I remembered it. I was 10 at the time & living in Galapagos. Tortuga Beach made such an impression on my young mind . . .
Tortuga beach made such an impression on my young mind now as an adult, I use it to meditate. I can close my eyes and focus on the beach and my body relaxes. I also use it as a place to go when I am doing meditation. In my mind’s eye, the beach is long, great waves, big sand dunes and no one is there. I’m the only person on the beach. In reality, we were 2-4 boys and no one else. During one of my inland treks for the Darwin Foundation, I approached the beach from the forest side and had a rough time reaching it by crossing the brambles that protect the beach from the higher elevations. It is such a secluded spot that very few people even know it exists. In a scale of 1-10, I would give it a big 15. There are people living in Galapagos? You might ask. Yes, there are! 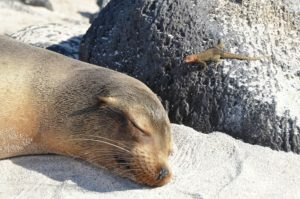 The Galapagos Archipelago is 600 miles from the coast of Ecuador, right on the Equator line & are a province of Ecuador. They are famous because of Charles Darwin. He visited the islands, back in the 1800’s and studied the islands and its animals and plants. The flora and fauna of the islands and their uniqueness were instrumental in his developing his theory of evolution and survival of the species. The Darwin finches with their beaks is one of the key elements of his theory. The Galapagos Archipelago is composed of 18 major islands, lots of smaller islets & plenty of rocks. The islands are young in the evolutionary cycle and are thought to be no more than 5 millions years old. The UNESCO & the Ecuadorian government formed a natural preserve back in 1964 and they have done a great job of keeping them pristine for study & future generations. The Islands were designated a park and the government keeps a tight rein on how many people visit, keep to the main tracks, and the forest rangers and the Darwin Foundation keep an eye on the animals and plants. I was lucky enough to live in the Islands during the 1960’s & I have fond memories of that time. I lived in Puerto Ayora (pop ~200- in the ’60s) in the island of Santa Cruz (one of the major islands with people). There are people who live in 4 large Islands but the rest are wild and free for the animals. The UNESCO also does a great job of keeping the islands pristine for future generations and science.